I’ve seen this problem when I prepare Dell PowerEdge 2950 servers using the Dell OpenManage Server Assistant 5.3 to install Windows Server 2003 R2 x64 with Service Pack 2. Once the OS installation is complete, if you enable Remote Desktop and connect from a Windows Vista machine using RDP, the RDP session/screen refresh is kind of slow. This only happens with x64 edition of Windows Server 2003. The problem seems to disappear when I install all the latest updates from Microsoft Update/Windows Update so I guess the issue is addressed in one of the fixes. Your enterprise root CA is an important piece of your enterprise network. Especially if you issue a lot of certificates for a wide variety of purposes to your users. A root CA also needs to be highly secured, both physically and over the network, because it contains the private key. A downtime on the root CA is seldom noticed because there is minimal need for using the server – except while issuing or renewing certificates. In fact, the Microsoft best practice is to power down your root CA when not in use. Now, what to do if your enterprise root CA crashes? Information about the enterprise root CA is written on the Active directory, in the registry of the Windows Server hosting the CA, and most important of all, the private key is also stored on this machine. Quite obviously, In the event of a total failure, a backup is required. Taking a backup of the root CA is often neglected. Believe me, it takes virtually no time to take a backup and it’s the only way to restore your CA with all private keys intact. Microsoft KB Article 298138 explains how you can backup your CA and move it to separate hardware. The procedure is also applicable if the hardware running your root CA crashes totally and you want to set up the same CA on a new server hardware. Make sure the D:backup folder is picked up by your centralized tape backup solution. Be extra careful with the tape because this contains the private key of your CA. Your organization should have the handling of tapes included in the security policy. Discusses how to enable Remote Desktop on Windows Server 2008 Server Core, the installation mode in which there is no GUI! Setup then exits and you are unable to complete the installation. This usually happens if there was a previous failed installation from the machine that you’re trying to join to the array. You will need to cleanup the values related to the server you’re installing from the ADAM installed on your first configuration store, which stores config information for the array. Open WindowsADAMADAM-ADSIEDIT.msc on the existing ISA Config Storage server. Navigate to CN=Configuration, CN=Sites, CN=Default-First-Site-Name,CN=Servers. Delete the server on which you have the installation problem. Re-run the installation, it should succeed now. I installed Windows Server 2003 Service Pack 2 on a client’s Exchange Server 2003 cluster on Thursday night (Yeah, I hear you – what a way to spend a weekend!). Everything went well, installation completed, rebooted and everything was happy and kicking. …until on Friday morning when the Exchange HTTP Virtual Server Instance failed. Since this resource was configured to ‘affect the group’, the failure forced a failover of the whole Exchange cluster group to the passive node. Within no time, Exchange HTTP Virtual Server Instance failed again, this time on the passive node! Someone press the Panic button!! The initial understanding of the situation was clear – Installation of Windows Server 2003 Service Pack 2 brought the mighty Exchange cluster to its knees. Error 0xfffffbbe returned from closing database table, called from function JTAB_BASE::EcCloseTable on table DeletedFolders. For more information, click http://www.microsoft.com/contentredirect.asp. Description: Exchange HTTP Virtual Server Instance 100 (servername): The IsAlive check for this resource failed. For more information, click http://www.microsoft.com/contentredirect.asp. Description: The server was unable to allocate from the system nonpaged pool because the pool was empty. For more information, see Help and Support Center at http://go.microsoft.com/fwlink/events.asp. I couldn’t find much on these errors on the Internet, and this is the reason for this post. Here’s what the problem is. My client is running Windows Server 2003 on a 32 bit server. 32-bit versions of Windows, as we all know, support a maximum of 4 GB RAM. By default, Windows slices the total memory right down the middle: 2 GB is reserved for the OS and 2 GB for the applications. Out of the 2 GB reserved for the OS, 256 MB is reserved for non-paged pool memory. My client is using the /3GB switch, which forces Windows to limit itself to 1 GB RAM and let the applications use 3 GB. But this causes the non-paged pool memory reservation to be reduced to 128MB instead of 256MB. Now, 128 MB is a tight little space. IIS uses non paged pool memory for processing requests. On Windows Server 2003 and Windows Vista, IIS stops processing requests once the available non-paged pool memory goes below 20 MB. Event 2019 is evidence for that. Of course you know, Exchange relies heavily on IIS. So that explains why the Exchange HTTP Virtual Server resource went down! But wait – what’s hogging up the non-paged pool memory? And how do we fix this? 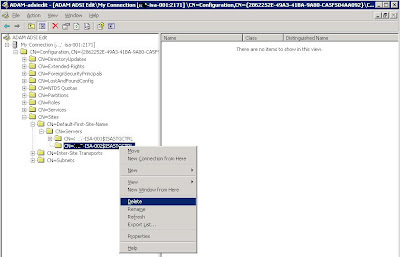 I also disabled the registry key HKEY_LOCAL_MACHINESYSTEMCurrentControlSetServicesTcpipParametersEnableTCPA registry value setting by it to zero on both nodes and other steps mentioned in KB936594. That was all it took to solve the problem!